At just after noon on Nov. 17, 2015, a tall, light-haired man drove his car right up to the front door of Jerry's Country Meat, the only grocery store in Arlington, Ga. He entered and proceeded to stalk up and down the aisles, quoting scripture and singing. The man had been hanging around the town of 1,400 for nearly a week, sitting in his car, which bore Alabama license plates, and staring at people outside the local bank. If anyone questioned him, he said he was looking for someone, but he wouldn't say who. The man was white, 58 years old. Inside the store, he asked the cashiers and deli workers whether they believed in God. "When they said, 'yes,' he went to ranting and raving at them," recalled owner Jerry Scarborough. "He was telling them all to get out" and that they were fired. "The only thing he said to me ... was that I was fired and to turn in my keys," Scarborough said, "all 14 of them." One of the store's employees, Dusti Mackey, called 911 to report the stranger, telling the operator, "I think something's mentally wrong with him. Like I think maybe he's crazy." Sgt. Mickey White was off-duty at the time, driving his squad car home from his shift at the Early County Sheriff's Office. There were no other police nearby when the call came in, so White took it. By the time he rolled up to the store, the man was back in his car, stopped in traffic, waiting to get through a construction zone. "Driver, get out of your car, put your hands where I can see them," demanded White, who can be heard in a dashcam video of the interaction obtained by APM Reports. "Put them on the hood of the car." The man ignored the orders and walked slowly toward White. "Put your hands on the hood of the car now!" White repeated. Then, just as he did inside the grocery store, the stranger began to sing a hymn: "Great is Thy Faithfulness." Now, though, he was facing a Taser gun. "I am going to tase you," White yelled. Seconds later, White fired, but the electric charge didn't knock the man to the ground. It only made him angry. He stumbled backward and then cocked his fist and charged at White. He landed two glancing blows before White drew his gun and shot the man, killing him. Dashcam footage obtained from the Georgia Bureau of Investigation shows the shooting of Derry Touchtone by Sgt. Mickey White. The video was edited by the GBI to remove personal information. At the 19:30 mark, White says "I could've fought him." Even in this post-Ferguson, Mo., world, where it seems that every police shooting of an unarmed person is dissected and analyzed, the stranger's death didn't draw much attention. It happened far from major media markets. Nobody demanded to see the video. There were no protest marches. And online databases of police shootings compiled by The Guardian and The Washington Post newspapers both misspell his name: It was Derry Touchtone. Every year, around 1,000 people are shot and killed by police, according to the databases. Of those victims, more than half were wielding guns, leaving officers few choices in how to respond. But in the rest of the cases, where people were holding knives, toy weapons, or no weapons at all, police might have taken additional steps, like using communication skills or waiting for backup, to try to defuse the situations. These are the cases that ignite public outrage, whether the 2014 shooting of unarmed Michael Brown in Ferguson; the shooting of Tamir Rice, who held a toy pellet gun, in Cleveland, Ohio, the same year; or the 2015 shooting of unarmed Walter Scott in North Charleston, S.C., as he was running away after a traffic stop. Touchtone, too, was unarmed. 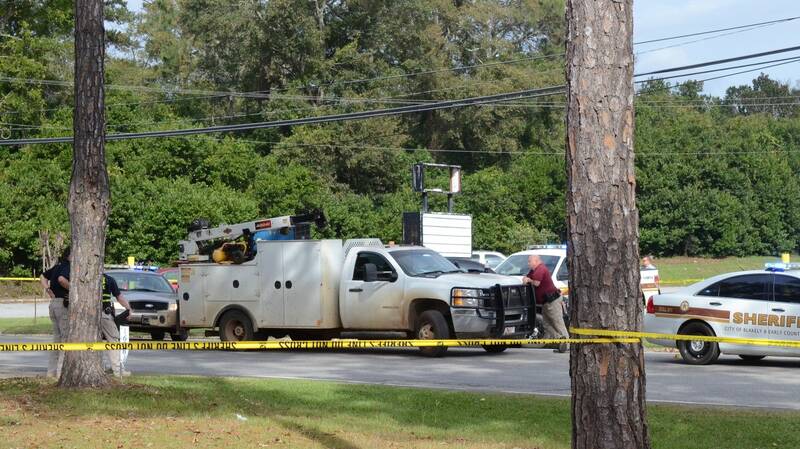 Nearly eight months after the shooting, White was cleared by a grand jury. About 20 minutes after the shooting, however, and still near the scene, White wondered aloud whether the incident could have been avoided. "You know the bad thing about it, Brent?" he said to a deputy in a conversation captured by dashcam video. "I could've fought him." The deputy responded: "Don't second guess yourself. You did what Mickey had to do." Whether White did what he had to do remains a question. What's certain is that he did what he was trained to do. 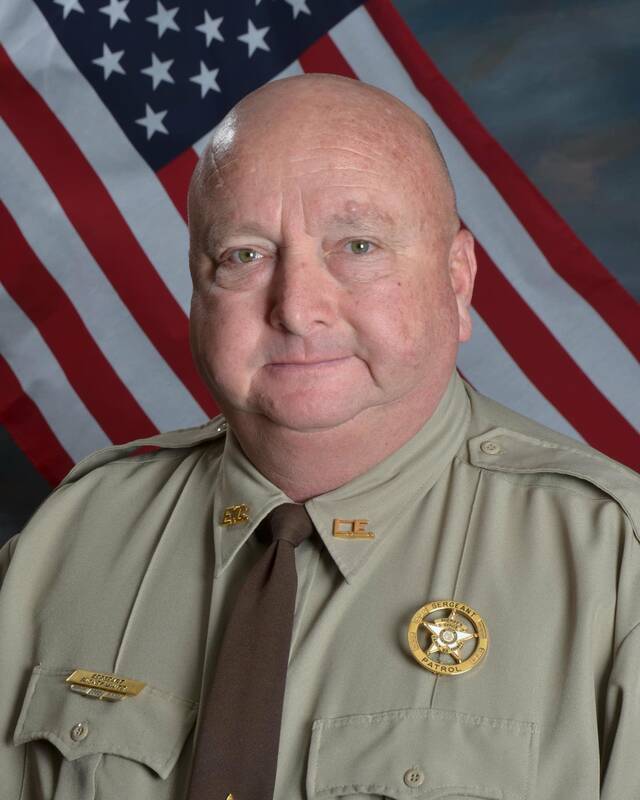 During White's 13 years working for the Early County Sheriff's Department, according to records kept by the state of Georgia, he'd received more than 600 hours of training on a range of subjects, including use of firearms, "vehicle pullovers," "active shooter response," "marijuana investigations," and even "courtroom demeanor and testimony." In fact, on the day White shot Touchtone, he had completed a five-hour training session that included an annual briefing on the use of deadly force. Yet he'd never received even an hour of instruction in the type of training that might have equipped him to better handle his encounter with Touchtone, who had a history of mental illness. White wouldn't agree to an interview. It's called "de-escalation" training, and it teaches officers to slow down, create space, and use communication techniques to defuse potentially dangerous situations. It gives officers strategies to more calmly deal with people who are experiencing mental and emotional crises. There are 34 states that do not require de-escalation training for all officers, according to an analysis by APM Reports, and only eight have done so since Brown was killed three years ago. As of February, Georgia requires one hour per year of de-escalation training. Though most states have boards that license peace officers and oversee state training requirements — boards with the power to require the training — the vast majority have failed to mandate it. That has left the decision of whether to train up to local chiefs and sheriffs. And many haven't done it, citing, among other reasons, cost, lack of staff, and a belief that the training is unnecessary or constitutes a rebuke of traditional policing. Three stories of unarmed people killed by police officers who had no de-escalation training. Read. Without statewide mandates, officer training in de-escalation varies widely from one police jurisdiction to the next, even within one metropolitan area. The inconsistency creates the troubling reality that a mentally-ill person like Touchtone — suddenly vulnerable and in a dangerous situation — could be at a higher risk of being killed by police simply by traveling between cities. There are no unassailable, scientific studies showing that de-escalation training leads to fewer police shootings. But anecdotal evidence abounds. Many larger departments have implemented the training, such as those in New York, Chicago, Dallas, Las Vegas, and Minneapolis. The department in Ferguson, Mo., made changes due to a consent decree with the U.S. Department of Justice. So far, some of the departments have reported reductions in use-of-force incidents. The Dallas Police Department, for example, saw an 18 percent drop in use of force the year after it instituted de-escalation training. In addition, since 2010, excessive force complaints there have dropped by 83 percent. Las Vegas, also, has reported a reduction in use of force and officer-involved shootings, which fell by more than half between 2012 and 2016, to just 10. Those who haven't implemented the training are sending a message that curbing use of force isn't a high priority, said Frank Zimring, a law professor at University of California-Berkeley who studies police shootings. "De-escalation is going to work only when saving civilian lives becomes an important objective of police administration and training," he said. After a police officer killed Michael Brown in Ferguson, Mo., on Aug. 9, 2014, activists, law enforcement educators and even a presidential task force called for changes in how police are trained. In particular, they argued police need better techniques in de-escalating tense situations. Since Brown's death, only eight states have mandated such training for all officers. Today, 34 states have no such mandate. In 24 of those states, however, there is a police-training board — called a Peace Officer Standards and Training board — that could have acted to require the training for police officers. Click on each state for more information. Versions of de-escalation training have been around for decades, but it entered the spotlight in 2015, when President Obama's Task Force on 21st Century Policing released its final report. The report prioritized de-escalation training for all police departments and emphasized the need for officers to establish a "guardian" mindset rather than a "warrior" way of thinking. It followed a spate of police shootings, many graphically playing out on cell phone video as the public watched and demanded to know whether the deaths could have been avoided. But an APM Reports examination of training records from hundreds of police departments — focused on the states with no de-escalation training requirement — reveals that most conduct no, or very little, de-escalation training. A deeper look into the records of 34 officers who shot unarmed people in 2015 and 2016 shows that more than half had obtained two or fewer hours of de-escalation training since at least 2012. Only one officer had received 40 hours, which is considered optimal. "The problem is, with 18,000 police departments [in the U.S.], you don't have any kind of uniform standards," said Chuck Wexler, executive director of the Police Executive Research Forum, which has been working to establish a de-escalation training model. The organization's "30 Guiding Principles on Use of Force," developed with input from chiefs and sheriffs nationwide, emphasize "proportionality," "de-escalation," and "the sanctity of human life," meaning all lives, not just officers' lives. "We never blame individual police officers for actions that they take, because when we look at the training that they receive, they're simply doing what their training told them," he said. Moreover, Wexler believes the training emphasis is misplaced. He says officers are well-schooled in using firearms but less so in de-escalation tactics and communication. Among more than 280 law enforcement agencies, new recruits received an average of 58 hours of firearms training and just eight hours of de-escalation training, according to the results of a 2015 survey by Wexler's organization. When it came to veteran officers, who usually must fulfill a yearly in-service training requirement, only 65 percent of the agencies taught de-escalation techniques. But those that did spent only 5 percent of their time on the topic, compared to 18 percent on firearms. 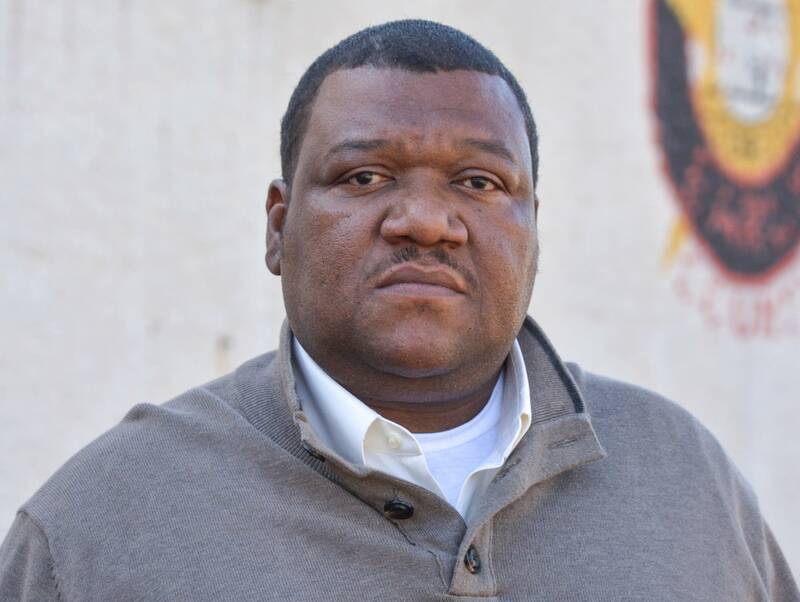 Derek Collins, a police de-escalation trainer in Marietta, Ga., thinks training priorities need to change. He watched the dashcam video of the Touchtone shooting with a reporter. "He's dead?" Collins asked. "Over that? He's dead? That makes no sense." Officers need to "practice patience," he said, adding that it appears White tried to resolve the situation too quickly, especially given that Touchtone was unarmed. "Things don't have to be resolved within the first 30 seconds .... Let him sing all day. Let him stand outside his car and sing until backup comes." It's not the first time White shot an unarmed man. In 2009, he tried to arrest a man after responding to a family dispute. The man resisted and began fighting White, who shot him, but not fatally. Early County Sheriff William Price doesn't question White's handling of the Touchtone call. "You can what-if that situation from nigh on 'til forever," Price said. "A lot of folks don't realize we have two seconds to make a decision. People sit around the table and judge us all day. It was a justified shooting. That's just basically it. So it had nothing to do with his training. He was well-trained. "In certain situations, yeah, you may approach a certain situation a certain way," Price said. "But in that situation, boom, bam, it happened." Police shootings tend to unfold quickly. 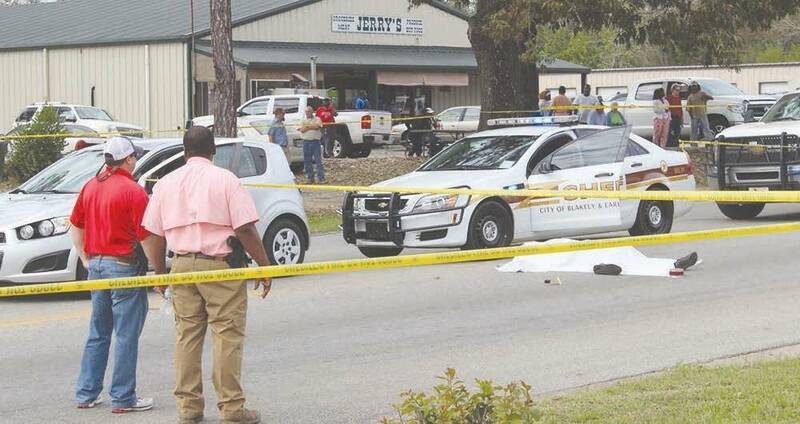 The shots that killed Touchtone were fired just 35 seconds after White's arrival. For Brown it was two minutes. For Rice, it was just two seconds. De-escalation training is designed to help officers slow the action down, in order to afford them more than a few seconds in which to make a decision. Yet Early County has not implemented the training, and Price questions its value. In his view, the ability to connect with people is a skill that comes with experience. "The first five years of my law enforcement career, I about had to fight everybody to put them in the car to arrest them," he said. "The next five years, it was a lot easier to talk them into getting in it. Over 27 years of experience, on-the-job training is the best you can get. Can't nobody teach you how to de-escalate, nobody other than the streets itself. You'll learn quickly." Paul Monteen, a retired police chief from Crookston, Minn., stood at the front of a classroom inside a non-descript government building in Center City, an outer-edge Minneapolis suburb. "Don't ask questions that can be answered yes or no, because I will guarantee you, you will get a yes or a no," he explained to the officers and other public employees at a free, day-long de-escalation class a few months ago. "You won't find anything out. You need to open-end those questions. You know, 'What's bothering you? You're mad. How come you're mad?' — so that people will tell you what they're thinking about," he said. This is what de-escalation training looks like. Monteen was explaining how to connect with people in crisis to avoid violence. There was one message he hammered: Buy yourself some time. "Slow down," he said. "Back off. Take cover. You don't have to win." Like many states, Minnesota has been rocked by recent police shootings, including the 2016 death of Philando Castile and the 2015 shooting of Jamar Clark. It's also among the 34 states that don't require all police departments and sheriff's offices to train officers in de-escalation. Perhaps because of the Castile and Clark tragedies, today there's a bill in the Minnesota Legislature that would require every officer in the state to receive 16 hours of instruction and provide $10 million to cover the cost. In the meantime, the state offers grants that pay for free training classes — like the one in Center City — for any law enforcement agency that wants them. Traditionally, officers have been trained to move quickly, take charge, and rapidly resolve a situation, said Bill Micklus, an officer for 29 years who serves as associate director of the Upper Midwest Community Policing Institute and who designed the eight-hour class curriculum. But that approach can be counterproductive, he said, especially with someone experiencing mental or emotional problems. "Moving quickly isn't always the best alternative for people in crisis," he said. "They can't assimilate. They can't change. They can't turn on a dime and just be okay because we order them to. Doesn't work that way." At the end of the class, the police and social workers break into small groups for role playing. In one of the role-playing groups, Jean Ramthun, who works in Chisago County's Health & Human Services department, was assigned to play an agitated Alzheimer's patient named Charles. "Okay. I'm having a temper tantrum," she said. "The nurse just made me mad." Deputy Ryan Edmonds, from the Chisago County Sheriff's Office, asked, "Why does she make you mad, Charles?" Ramthun responded: "I just. I don't know. I don't know where it is. I haven't seen my stuff. Maybe Claire knows where it's at." Edmonds, trying out a technique called "active listening," asked, "Claire?" The idea is to show you've been paying attention by repeating the last thing someone said and turning it into a question. "We can certainly ask Claire," Edmonds said. "And who is Claire to you?" This wasn't Edmonds' first time in a de-escalation class. He took one a couple of years ago. But he said when he was a new officer, he wasn't exposed to these concepts. "I went through basic training 12 years ago, and they didn't have any of the same or similar topics," he said. The emphasis was on use of force, not on communication or listening skills. Now, he uses this training every day on the street. "It works really well," he said. Evidence suggests that officers who go through de-escalation training come away with more sympathetic attitudes toward people with mental illness. A 2014 study from Emory and George Washington universities analyzed the use of force at six policing agencies in Georgia. Officers trained in crisis intervention techniques were more likely to verbally engage mentally ill people during interactions. They also were more likely to call for mental health transport than to simply haul them to jail. Derry Touchtone's mood swings and delusions started when he was in his early 20s. Though his criminal record reveals only a 1996 misdemeanor for making harassing phone calls, he did occasionally encounter law enforcement during his bouts with mental illness. That ended after he was confronted by deputy sergeant White on a street outside Jerry's Country Meat. "My first words were, 'I don't care,'" said his 30-year-old son, Clint Touchtone, who hadn't seen his father in a decade. Touchtone, who has an easy grin, sat on the couch at his mother's house outside Birmingham, Ala., where he's lived since getting out of prison last year. "Just a lot of resentment at that time coming out," he said. "I really didn't want to deal with it, but that was selfish. He ain't never coming back. That settled down on me. Then I kind of got haunted. It took a toll on me. It kind of messed with me." Thinking about the violent manner in which his father died is difficult. 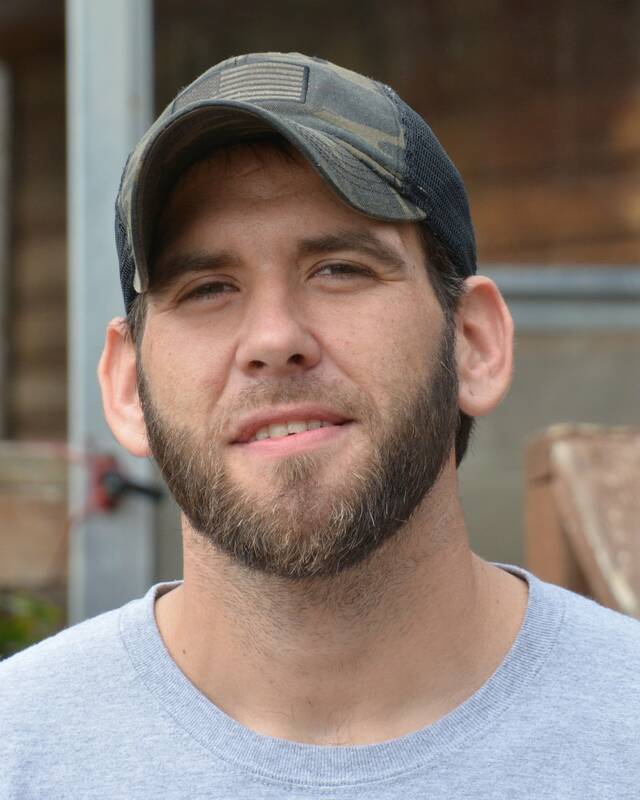 "It's kind of depressing, knowing that was the last thing he seen there," Touchtone said. "It just seems like it was uncalled for — the whole scene. "I miss him," he said. Markeita Bullard was well aware of Derry Touchtone's problems. 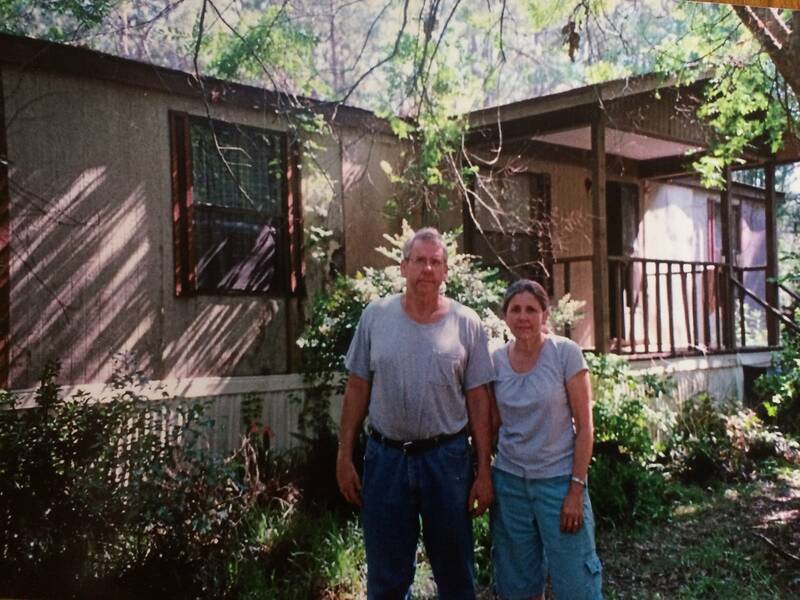 She was the landlady at the trailer park where he lived for more than a decade and one of two mental health counselors at the local clinic. Touchtone could be a good friend, she said. "There was this old black lady that he loved, and she loved him. And he would go catch fish out of the river and bring them to her. And she would cook for both of them. I mean he was just that kind of person." 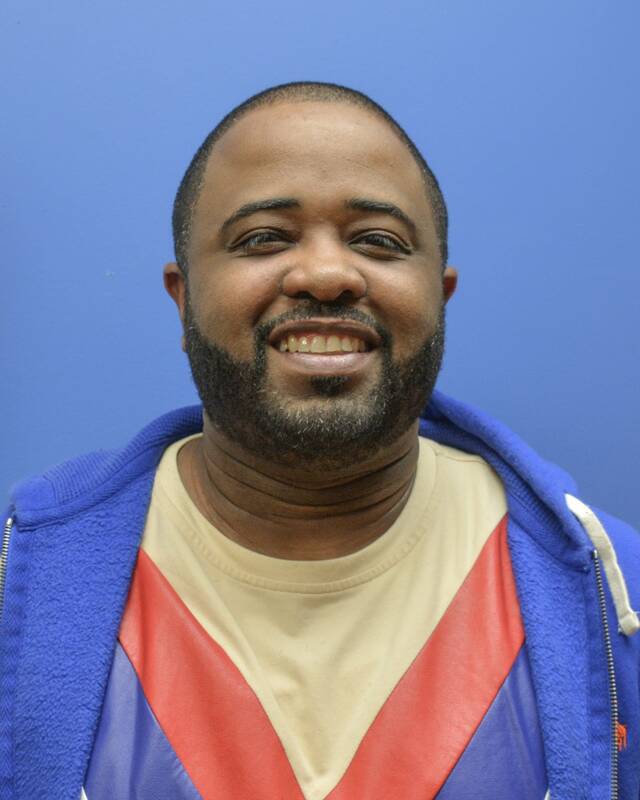 As a mental health worker, Bullard took a class in de-escalation. And she thinks more officers should do the same. "I have a lot of respect for most of the law enforcement people, but ... they need training in this area," she said. Beyond mental health crises, Bullard said the training could help police better deal with drug addiction, domestic violence, and angry parents watching their children taken from their homes by protective service workers. "All of these are volatile situations and they have the potential to blow up in your face," she said. Last year, the Minneapolis Police Department began putting all 800 of its officers through an intensive, week-long version of de-escalation training. At a press conference in August, Police Chief Janee Harteau announced the effort, asserting that it represented a significant shift in the way officers would approach their jobs. "As a society, frankly, we have taught and told officers we want very quick resolution," she said. "Hurry up and answer that call. Get to the next call. Hurry up and resolve the situation. He's got a knife. He's got a gun. Take care of that quick. And we're saying, 'Slow down.'" The training is an attempt to change the very culture of the department. "We have added 'sanctity of life' in our policy as the cornerstone of our use-of-force policy," Harteau said. "In life-threatening situations, preservation of all life is held in the highest regard." 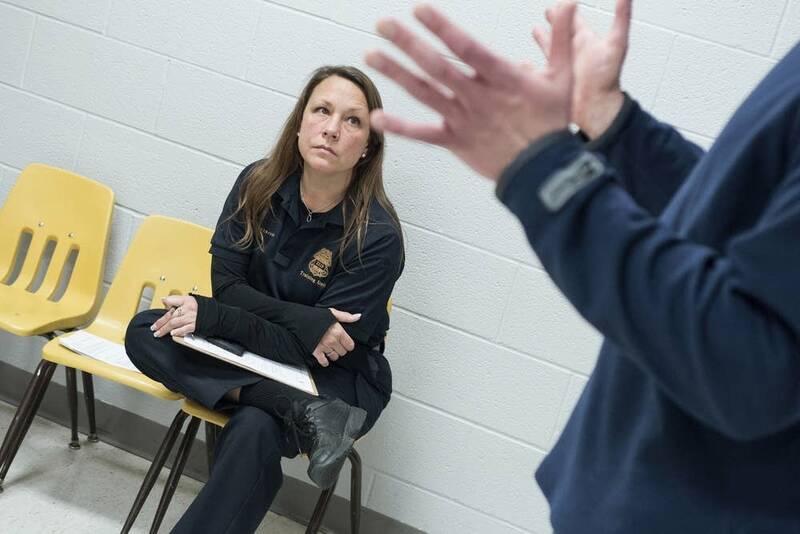 When Officer Jennifer Lazarchic started at the department 21 years ago, she was taught three simple steps to get people to comply with her orders: Ask, tell, make. "Ask them to do what you'd like them to do," said Lazarchic, who has completed the de-escalation course. "If that doesn't work, tell them to do what you'd like. And then when that doesn't happen, you make them. That's still true. You still want to make them. We still have to accomplish our goal. But what we're doing is we're giving the officers more tools to do that." In January, Lazarchic got the opportunity to use some of those tools. She received a call about a homeless man in downtown Minneapolis screaming at people and accusing them of trying to steal his cell phone. "My partner and I got there and he was sitting on the ground," she said. "Twenty years ago that would have been: 'Okay, you go on one side of him. I'll go on the other. We'll both grab an arm and we'll cuff him and take him to the hospital.'" Instead, Lazarchic kneeled in front of the man. She made eye contact and started a conversation. "I just was very honest with him, and let him know I thought that his behavior appeared paranoid," she said. "And he basically started crying. In having this conversation with him, and continually reassuring him that I wanted to help him and not hurt him, he started to talk about wanting to go to the hospital." Lazarchic got the man into an ambulance without using handcuffs. De-escalation training is controversial in the policing world. When a Congressional House bill was introduced in 2016 that would have required states and local policing agencies that receive federal justice grants to implement de-escalation training for all officers, powerful law enforcement organizations opposed it. Called the "Preventing Tragedies Between Police and Communities Act of 2016," the bill would have required officers to learn more about "non-lethal methods of applying force" and "verbal and physical tactics to minimize the need for the use of force," among other skills. The bill was based partly on the 30 Guiding Principles developed by the Police Executive Research Forum. The Fraternal Order of Police, which calls itself the world's largest organization of sworn law enforcement, and the International Association of Chiefs of Police issued a joint statement in early 2016 that read, "We cannot reasonably expect law enforcement officers to walk away from potentially dangerous situations and individuals in the hope that those situations resolve themselves without further harm being done. Reasonable use of force in any given situation must be at the discretion of a fully sworn and trained officer." Because of opposition and other factors, the House bill died. The organizations eventually softened their views on de-escalation training, but plenty of pushback remains. "I think it's creating a situation where officers are putting themselves at risk and the community," said Jamie McBride, a detective with the Los Angeles Police Department who also serves as a leader in the union that represents officers. He thinks de-escalation can cause officers to hesitate when they need to be decisive. McBride told the story of an officer who was recently confronted by a suicidal man with a knife. The officer didn't want to kill the man so he used rubber bullets, which didn't work. The man eventually stabbed the officer in the arm before his partner shot the suspect. "That's something we shouldn't have to see," said McBride. Some view mandated de-escalation training as a criticism of policing itself. "I think it's based on a false premise," said Mike Sherlock, a former police lieutenant and sheriff's deputy, who is executive director of Nevada's Commission on Peace Officer Standards and Training — called a POST board — which licenses officers and oversees state training requirements. "And the false premise is that officers are prone to excessive force." Most states have regulatory POST boards, which have the power to require all departments to implement de-escalation training. The Nevada POST commission, however, hasn't taken steps in that direction. And Sherlock doesn't think it's necessary. He said officers are already taught that communication skills are key and that force is a last resort. "We do do that," he said. "That is what we're teaching. These concepts are not new ... Doing exactly what you're talking about, training exactly what you're talking about, is the reason that we have so few use-of-force incidents in this country. "I want officers in my neighborhood who make legal, moral, and ethical decisions," Sherlock said. "And my point is we have to be very careful how we couch this. If it's about using no force, we're going to have officers hurt and we're going to have citizens hurt." Chiefs and sheriffs cite many reasons for not implementing de-escalation training. Some view the training as a fad, simply a new face on the common-sense policing they've been doing for decades. Others see it as dangerous or a rebuke. "Sometimes, it's coming across as a negative connotation for police officers," said Noble Wray, the former police chief of Madison, Wis., who, as Chief of Policing Practices and Accountability for the federal office of Community Oriented Policing Services [COPS], helped implement the 21st Century Policing report. While at COPS, Wray met with more than 100 department heads. "We are motivated in different ways," he said. "There are those departments that want to constantly improve and do the right thing. There are those departments that are just treading water. They just can't do it. Then there are the departments that are flat out not doing it. And at times, they end up being motivated by things like lawsuits and consent decrees." SOURCE: APM Reports made open records requests to Minneapolis, St. Paul, each city that borders them, and the county sheriffs' offices that cover the area. The result was a database documenting 647,316 hours of training completed by 1,849 Twin Cities law enforcement officers over the past five years. Reporters went through 5,850 different course titles and researched whether they concerned de-escalation or dealing with mentally ill people. A few months before St. Anthony, Minn., Officer Jeronimo Yanez shot and killed Philando Castile last year, department chief John Ohl, who would soon retire, was interviewed by a reporter. He grumbled about the 21st Century Policing report, characterizing it as a solution in search of a problem. "Nothing is significantly broken in law enforcement right now," he said. "We are better trained, better selected, better educated, held to more standards, higher accountability, with better policies than ever before in the United States of America's history. Yet we're in the toilet right now." He said his department was already doing 90 percent of what the 2015 report recommended. "And I just read it and I go, 'Oh, yeah, doing, doing,'" Ohl said. "'You mean some people don't do that? Doing, doing, doing.'" But as far as de-escalation training, the St. Anthony Police Department did significantly less than many others in the Twin Cities suburbs, according to records obtained by APM Reports, though officers there did plenty of other training. 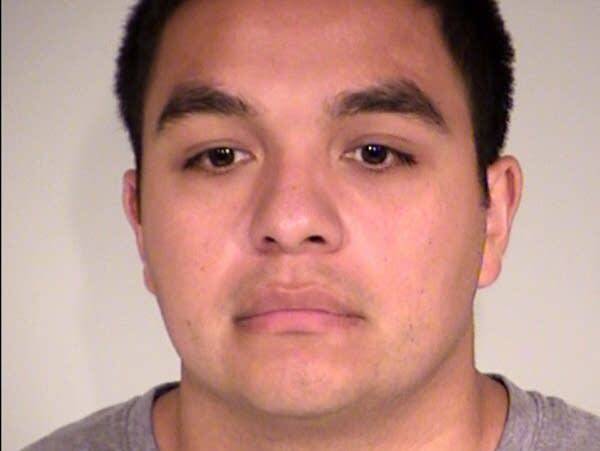 During Yanez's five years with the department, he had received 344 hours of training, including a 20-hour course called the "Bullet Proof Mind," which, according to one recording of a session, warns officers that they are "dealing with individuals who are motivated to kill in a way that we have never seen before." Yanez also spent 16 hours on a course called "Street Survival," from the same training company. Conversely, he had obtained just two hours of de-escalation training. Yanez is now facing manslaughter charges. His lawyers argued in a court filing that Castile was responsible for his own death because he was intoxicated with marijuana and failed to follow Yanez's commands not to reach for his gun. Castile denied he was pulling out the weapon in the moments before Yanez shot him, according to a partial transcript of a police dashcam video contained in another court filing. Investigators found the gun in Castile's pocket. Clearly, de-escalation techniques won't prevent every shooting. Two years ago, in the Minneapolis suburb of Columbia Heights — where the police department has done a lot of de-escalation training — a man named Michael Kirvelay showed up at his sister's cleaning business. He didn't seem like himself. He was yelling and holding a BB gun. Officers arrived and their de-escalation training initially appeared to have little impact on their approach. They screamed at Kirvelay for two minutes, demanding that he drop the gun. "Stop yelling at me!" Kirvelay finally said. At that, the training seemed to kick in. The officers talked more softly and addressed him by name. "What's going on tonight that's got you so worked up?" one of the officers asked. But Kirvelay grabbed his sister and put the BB gun, which was unloaded, to her neck. Police shot him, killing him. The lack of studies presenting a concrete case for de-escalation training is yet another reason for inaction on the part of police departments and sheriff's offices. Because fatal police shootings are rare — only about one out of every 10,000 arrests turns deadly — it's hard to measure whether an officer is less likely to shoot someone after the training. In reality, an officer is unlikely to shoot anyone ever. But, there is plenty of anecdotal evidence showing that de-escalation training can save lives under the right circumstances. "Intuitively, we know it will work," said Wexler of the Police Executive Research Forum. "But I think for the short term, we're going to have to be comfortable with anecdotal information." 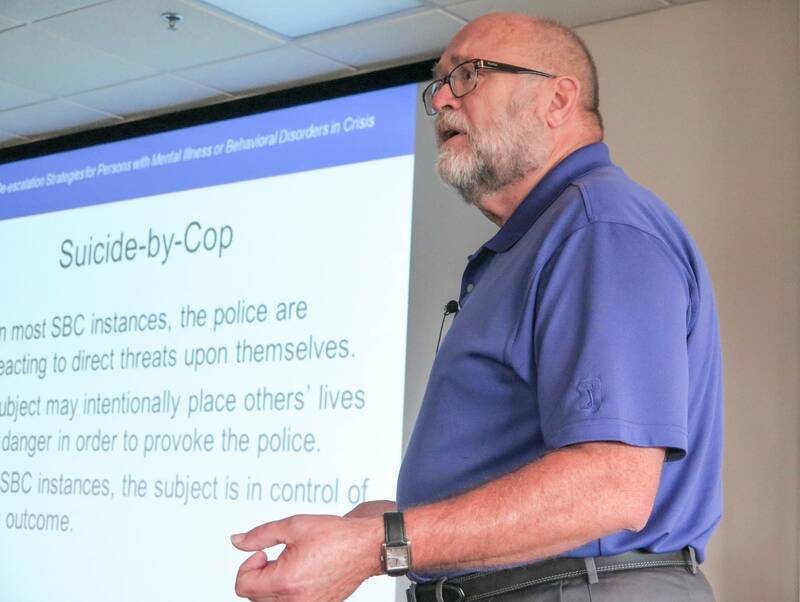 Randy DuPont, a clinical psychologist at the University of Memphis, who helped develop some of the earliest police de-escalation training in the 1980s, said that given all the variables inherent in policing, researching the real-life impact of the training has always been a challenge. "One has to do what one can do, given the applied nature of this," he said. Most POST boards have the power to set new statewide training requirements, which must be met for officers to renew their licenses. Yet until just a few years ago, only eight states mandated de-escalation training. Following a string of high-profile police shootings and protests across the nation, that number doubled to 16. But, that still leaves 34 states that don't require de-escalation training for all officers. APM Reports interviewed POST directors around the country and asked why they hadn't done so. "I get asked all the time in meetings that I go to, 'Why don't you make this issue that I'm proposing mandatory?'" said David Harvey, who directs the Michigan Commission on Law Enforcement Standards. "And my response is: 'Get in line,' because everybody wants their training mandatory. There's only so much that we can mandate, because somebody has to go to work. We can't train 2,080 hours a year." POST directors repeatedly cited the belief that it's too burdensome for departments to implement more training. They said it's especially difficult for small, often far-flung departments, to send officers to training centers and cover missed shifts. Small budgets, they said, make the training hard to pay for. "And so, if we start to mandate hundreds of different things to the department, then that's going to cost them money, which would then cost your taxpayers money," said Capt. Mark Bodanza, commander of the New Hampshire Police Academy. "And so we have to be very careful about saying, 'You will do this,' without supporting it financially." The training can be expensive. New York City spent $17 million to send 22,000 of its officers through a three-day de-escalation training in 2015, according to a department spokesperson. The training can be paid for with federal, state or local dollars, or a combination of all three. And there are a handful of grants for which departments can apply. Because the 21st Century Policing report came out recently, Wray acknowledged that funding, at least at the federal level, isn't fully in place. Still, he said, there are creative ways small departments can implement de-escalation training, such as utilizing online lessons for part of it or banding together on a regional basis to pay for in-person training while covering each other's shifts. He said bits of it could even be imparted during daily roll call meetings. The San Francisco Police Department's assistant chief, Toney Chaplin, considers the expenditure on de-escalation training a good investment. In July 2016, his officers confronted a 35-year-old man named Pierre Dyson. Dyson was shirtless and agitated, standing on a busy downtown street corner. He said he wanted to die. Police believed he had a gun, but he refused to take his hands out of his pockets. Bystanders recorded the action on their cellphones. In one video you can see four officers with their guns drawn, surrounding Dyson. Chaplin was in a meeting at City Hall a few blocks away. He headed to the scene and told his officers to slow down and avoid rushing in, just as de-escalation training suggests. "We decided to wait this guy out to save his life," Chaplin said. Police cordoned off the area. They checked Dyson's psychiatric record and brought in his family to help negotiators. A SWAT team in tactical gear was positioned atop an armored vehicle, but when police finally did fire at Dyson, they shot shells filled with bean bags. After another hour, they threw stun grenades and charged in with shields. They finally arrested Dyson and found a loaded revolver in his pocket. Chaplin keeps a chart in his office detailing five years of police shootings in San Francisco. It shows that when police shot, they typically made that decision quickly. "In under a minute, 45 percent of the shootings occurred," he said. At one minute, he explained, the portion of shootings dropped to 10 percent and at two minutes, only 5 percent of shootings occurred. At three minutes, Chaplin said, "The graph falls off a cliff with each minute that you stall these things out. If we create this time and distance, as you can see from this graph, we save lives. "I'm not saying it's a magic pill to fix everything. But it's worked, and we've had stunning success with it. And we're going to continue to de-escalate situations." In the majority of states that require de-escalation training, lawmakers responded to public pressure, which has translated into laws passed by state legislatures. Sometimes the laws have been paired with additional money to help cover the expense. POST boards tend not to act on their own, partly because they are run by current or former law enforcement officials — police chiefs, sheriffs, police union leaders, politicians — who may be reluctant to impose new requirements on other law enforcement officials. In other words, it comes down to politics. "One of the reasons why these fancy-looking boards are not aggressive is they are essentially representatives of local governments," said Zimring. "That isn't rocket science. That's basic political science." More than one POST director cited the issue of local control, the desire to allow chiefs and sheriffs to determine their own protocols. "Training is difficult and it's an expense," said Gary Steed, executive director of the Kansas POST commission, who was once the sheriff of Sedgwick County. "Generally, I think agencies know best what type of training their officers need." Under the Obama administration, the federal government was a major force in pushing police to get more de-escalation training. But President Trump has set a distinctly different tone. "I am the law and order candidate," he declared at the 2016 Republican National Convention. During a campaign speech in Wisconsin, he vowed to end the "war on police." The federal government's most powerful tool when it comes to forcing change among local law enforcement agencies is the Department of Justice. It has the power to sue police departments for alleged civil rights violations and enter into agreements — in essence, blueprints for change — known as consent decrees. The consent decree between the federal government and the city of Ferguson, for example, requires that the police "use de-escalation techniques and tactics to minimize the need to use force and increase the likelihood of voluntary compliance with legitimate police orders." These consent decrees, and the reforms they demand, may be short-lived after Attorney General Jeff Sessions said earlier this year he would review them. "Local control and local accountability are necessary for effective local policing," Sessions wrote in a memo to staff dated March 31. "It is not the responsibility of the federal government to manage non-federal law enforcement agencies." A handful of police departments have taken de-escalation to a new level and are honoring dangerous situations handled without bloodshed. In 2015, Philadelphia Police Commissioner Charles Ramsey noticed that many of the department's awards went to officers involved in dramatic fire fights. "And we thought about it, and we said, 'Well, what about those incidents when an officer was confronted with a very dangerous situation and they didn't resort to using their firearm.' We need to recognize that as well." Today, in addition to medals for valor, heroism, bravery, and honor, Philadelphia gives out an official commendation for de-escalation. In Los Angeles, the police department gives a similar commendation. There, though, the union representing officers opposed what's called the "Preservation of Life Award," claiming that it rewards officers for risky behavior, endangering their lives and the public. "What we don't want to see is a flag-draped coffin and the chief speaking at an officer's funeral stating, 'This brave officer will be awarded the Preservation of Life medal,'" reads a blog entry on the union's website. Ramsey said the decision was controversial in Philadelphia, too, and he worried that officers wouldn't come to the ceremony to accept their certificates. But, said Ramsey, who co-chaired the President's Task Force on 21st Century Policing and recently retired, "Every single person showed up to receive the award. And I haven't heard anything negative about it since." 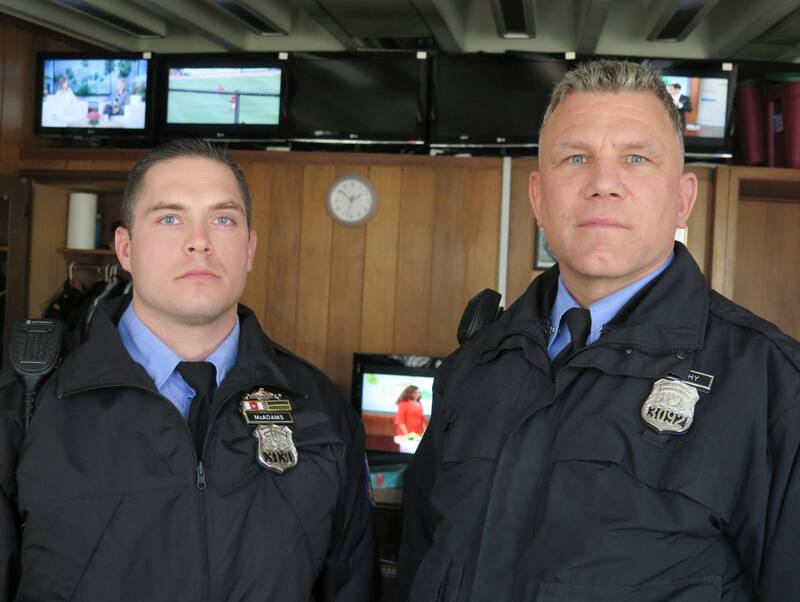 Officers Ryan McAdams and William Murphy are two of the 57 Philadelphia officers who have been awarded the department's "Official Commendation for Tactical De-escalation." They were honored for the way they handled a 911 call. At 10:30 p.m. on May 1, 2016, a woman called to say she had gotten into an argument with a man over a parking spot at the back of her sister's property. The officers arrived and the woman said that when she'd informed the man she was calling the police, he'd responded, "Fine, go ahead. I'm going to go get a gun." "He was intoxicated," Murphy said. "It was his birthday." 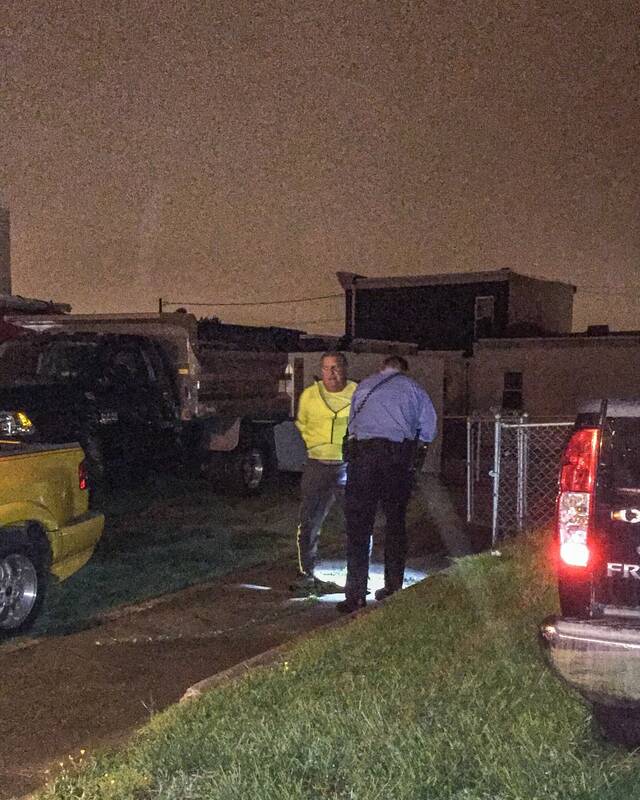 The officers found the man, wearing a yellow track jacket and jeans, approaching the sister's house. He had his right hand hidden behind is back. "At which point, based on the information we received, we can only assume he has a gun," Murphy said. Both officers drew their weapons. Over and over, they told the man to show his hand. "After what seemed like a half hour but was probably five minutes, he finally raised his right arm in a 90-degree manner, to the side." He was holding a silver .357 revolver. Had the man made a threatening move, the officers might have shot him. But he didn't point the gun at them. "Neither one of us felt that our lives were at significant threat at that point," said McAdams. Following repeated commands, the man dropped the gun. "I guess something eventually clicked in his head, like, 'Hey listen, they got their guns pointed at me and I have a gun in my hand,'" he said. "'This may not end well.'" Murphy recalled that the man "actually was thanking us for not shooting him. During the car ride back to our district, he was thanking us. He knew his actions were wrong." McAdams remembered saying in response, "Well, thank you for not making us shoot you." Will Craft, Emily Haavik, Michael Montgomery, Ethan Nelson, Jack Rodolico, Jennifer Vogel and Shoshana Walter contributed to this report.